i have been out a number of times and only found fish in deep water over 200 feet. Any one getting them in close. I also fished Bronte this morning with no luck, second time out with no fish. I was marking some fish and there were a lot of boats out there today so I'm sure someone is catching fish. Nothing happening for me yet either but things will turn around soon. We got small ones at 55ft in 120 fow last night. Went out Saturday morning, 30 ft down in 140 fow produced a few nice fish. It looks like guys are out really deep or scattered all over inside 150 ft, Saturday was a positive outing so hopefully it's a sign of things to come!! went out Sunday from 730 till 12. fished 240 feet into 100. only fish that hit was a 10 pound laker when I decided to knock the bottom with my rigger ball cause i was getting bored. beauty day on the water, no fleas, a few flies, flat water. But no fish. marked a handful in the upper column. Try using glow spoons earlier. 200 fow thereabouts with riggers set in the 45 to 60 ft range seems to be the trick right now. green moonshine morning to about 10am. haven't tried my trusty flies and spin dr's yet. Bronte: Sunday Morning 7:30 - 12 noon. Fished 140 to 100 feet. didn't move a rod. Fished upper 50 feet plus one rigger on the bottom for lakers. Frustrating to say the least. Was out with 'LeVanthe8man " yesterday morning and we caught 6 small Salmon in deep water 200-250, and down 40-60 feet with green and blue flies. We also fished in 150 feet down 140feet and picked up a great laker over 10lbs. However we are still in the hunt for the Salmon over 15lbs. Out of bluffers got a mix of trout and salmon on Saturday got 8in boat. Sunday was awesome got went 12 for 20. A mixture as we'll all on spoons black and purple was doing it for us. Give it some time. Bronte will heat up soon! 230 to 250fow 30ft to 50ft down mostly 30! Going out tomorrow hoping for some Salmon. So looks like most of you are saying 100 to 150 fow and 35 to 50'. Hopfully she heats up tomorrow. fished bronte sat am 5:30 to noon, from 140 fow out to 270 fow, down 30-55 ,pulling ever spoon combo we could come up with and not even a hit. marked a few clouds of bait fish and the odd fish but no takers, None the less was a beauty day on the water, Hopefully things heat up soon. The last really good fishing I had out of Bronte was 2 to 3 years ago with average days of 4 to 10 salmon over 10 - 20 lbs. No idea what's happened that end of the lake but the salmon are gone. Last year was my worst there. Fished on average 2 to 3 days a week out of Bronte during the derby and had more skunks than I could count. Port Hope and Bluffers will be on the menu this year. Yea I dont know what is going on at that end of the lake this year, but the fishing there isnt the greatest as in past years... I know I have had luck later in the season when the fish are staging at Bronte, but thats about it..
Was out sunday in Bronte and had a good but long day. Had 4 good kings 19-22lbs but released all. most of the big ones were in 150 feet down 30-45 feet. I'm going to give it another try this Saturday morning. Hopefully we land a few as its been pretty disappointing so far. 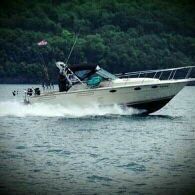 Keep our boat in Bronte so not sure how long of a run it would be up to Bluffers or Port Hope but I'm considering it.